The Zephyr was scheduled to pull into in Denver at 7:15am. By the time we climbed into our beds the night before, the train was already running late. Because Amtrak puts padding into their schedules we weren’t sure if they would be able to make up time during the night, or even whether the train would fall further behind. We had to assume that the train might be on time, and so I set an alarm for 6:00am the next morning and went to bed. At 6:00am, when my alarm went off, I checked our location and the schedule: we were indeed going to be late. Late enough that I was able to reset my alarm for 7:00am and doze off for a while longer. By 7:00, it was clear that we were falling behind again, but as I was awake at this point I got up anyway. We knew that when Dave and Brigid picked us up we’d be going to breakfast, so we elected to forego the Railroad French Toast (one of Nancy’s favorites) and simply showered, dressed, and made sure we were ready to get off the train whenever it finally did roll into the Denver station. Which turned out to be just after 9:00, about two hours later than scheduled. Before I leave the subject of the Zephyr to Denver, I want to say a few words about our room on that train. Each double-level sleeper has something like six full-sized bedrooms (with en-suite bathroom facilities, including a shower) on the upper level, fourteen roomettes split between the upper and lower levels, and two other lower level rooms. One of these other rooms is the Handicapped room (room ‘H’), which, obviously, is intended for people with physical impairments. Larger than a full-sized bedroom, it stretches the full width of the train car and includes a large bathroom rigged for handicapped access. The other “special” room is the Family Bedroom (room 15). Like the Handicapped room, this one extends the full width of the car. Unlike the Handicapped room, it does not have an en-suite bathroom: you need to use the facilities down the hall. The Family Bedroom, however, technically can sleep four persons: two in full-length beds arranged across the width of the car, and two in short (4-1/2 foot) beds that run lengthwise. Obviously, this room is intended for families with small children, but there is nothing to prevent anyone from reserving this room. Which we did on the Zephyr from Chicago to Denver, since all of the full-sized bedrooms were already booked by the time we made our reservations. Except for the small inconvenience of not having a dedicated bathroom, the Family Bedroom is very nice: it is the largest room on the train, leaving you plenty of room to maneuver even when the beds are set up. If you don’t have small children, as we didn’t, only the two full-sized beds get made up, leaving a pair of facing chairs with a stowable table in between that can be used until you are ready to go to bed. (In the full-sized bedrooms and the roomettes, once the room is converted to night mode there is no seating except on the beds themselves.) Finally, because the Family Bedroom stretches the full width of the car, it has windows on both sides, meaning you have an unobstructed view out either side of the train. In this one respect a full-sized bedroom isn’t too different since you have one window in the room itself and another window in the hall opposite; simply by leaving your door open (or, at least, the curtain that covers the door, since the doors are glass), you can see out through the hallway window. Roomettes are a different story, however, since the hall runs down the middle of that part of the car and your ability to see out the window of the opposing roomette is highly dependent upon the person occupying that other roomette. Oftentimes they close the curtain over the door, giving themselves privacy and blocking your view. But back to Denver. As I said, we arrived about two hours behind schedule. And somewhat disappointingly, we didn’t arrive in Denver’s Union Station. Denver has always had one of the classic Union Stations, and will continue to do so in the future, but at the moment the station is being remodeled to accommodate a number of commuter rail lines, regional buses, and light rail in addition to the cross-country Amtrak trains. Until some time in the first half of 2014, Amtrak service has been relegated to a small temporary station a few blocks from Union Station. Although this temporary station is full-service, it is a boring concrete block building that has none of the flair of the old Union Station. I had to check the signs as we got off to make sure we were in the right place. Sure enough, Coors Field was right there on the other side of the tracks. Later we saw the construction going on around nearby Union Station. I was glad to see that they weren’t demolishing the old station, but rather making it more valuable to the city of Denver. We got off the train, not seeing Dave and Brigid right away. Nancy checked inside the station as I dealt with the bags, and shortly emerged with my brother and sister-in-law in tow. They then led us to their pickup–it seems strange to see my brother driving a huge pickup–and we were off to breakfast. Breakfast that morning was at a place that came highly recommended (although Dave and Brigid hadn’t been there before): Jelly Cafe. It wasn’t in the greatest part of town–in the “Capitol Hill” neighborhood, it was surrounded by tattoo parlors and the like–but inside it was clean and fresh, with an amazing display of rare old cereal boxes on the walls. “Quisp” and “Quake” (remember those?) were probably the most recognizable boxes there; they also had Smurf Magic Berries, Transformers, Corn Flakes with Bananas… But the food was what we were there for. Dave and Brigid shared a selection of “Donut Bites” (home-made donut holes with fancy fillings and/or toppings, essentially), while Nancy and I had more conventional fare. The Donut Bites turned out to be somewhat disappointing, but I was happy with my sausage and onion scramble, and I believe that Nancy was pleased with her breakfast as well. Breakfast done, it was time to head out to the Wilson Ranch. Yep, Dave and Brigid live on a real horse ranch; thus, the pickup truck. They live in a rural area of Colorado Springs, on about forty acres of horse property. With a barn or two, a huge riding arena that Brigid had constructed, three fenced pastures, and their nice-sized house, the Wilson Ranch is quite a place. Very much a working ranch, other people were constantly coming and going, either to train horses, to ride their horses, or to do chores around the ranch. It was a bit odd to see people drive up and head straight out to the barn (and later leave) all without having visited the house. But that’s life on a working ranch, I guess! After giving us a house tour and letting us get settled in, Brigid gave us a tour of the ranch proper. All I can say is, if I get reincarnated after I die, I wouldn’t mind coming back as a horse on Brigid’s ranch. 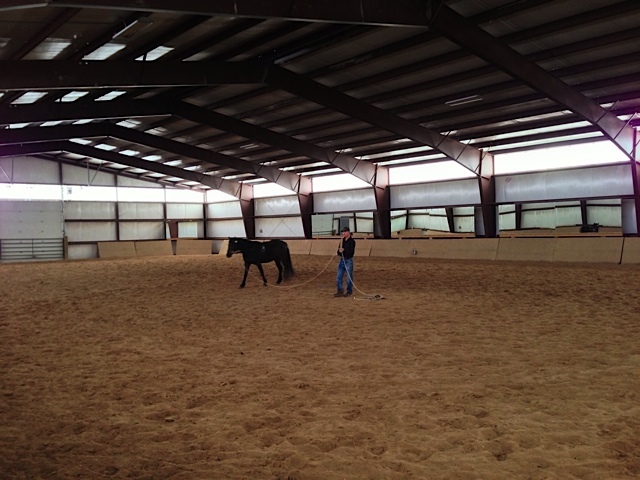 The place is spotless, and the horses appear to get the best of care. Two of them are Brigid’s; the remaining horses are owned by others who pay to board them there. The barn is one of the nicer ones I’ve seen, and the riding arena is just amazing to behold. It is a huge, steel-framed, fully enclosed arena, where riders can work their horses in comfort no matter how hot or cold it is outside. On especially cold, snowy days there is even room, using some portable stabling to augment the few permanent stables in there now, to contain all of the horses so that they can be housed, fed, and exercised in comfort and safety. All-in-all, it is a veritable Eden for horses! Wanting to keep things low key, and because we were in the mood for some home cooking after all of our train and restaurant meals, Dave barbecue’d our dinner that first night. We enjoyed a cozy family meal with the four of us plus Kelly, their daughter, who is just about to graduate from high school (and will be off to TCU, in Fort Worth, Texas, making David and Brigid empty nesters). We had a great time filling them in on some of the more esoteric details of train travel and our trip, and reassured them that their boys Mark and Kevin had been great hosts. The next day was a school day for Kelly, but Dave had once again arranged to take the day off work (he works for HP, but from an office in his house) so that they could show us some of the local sights. 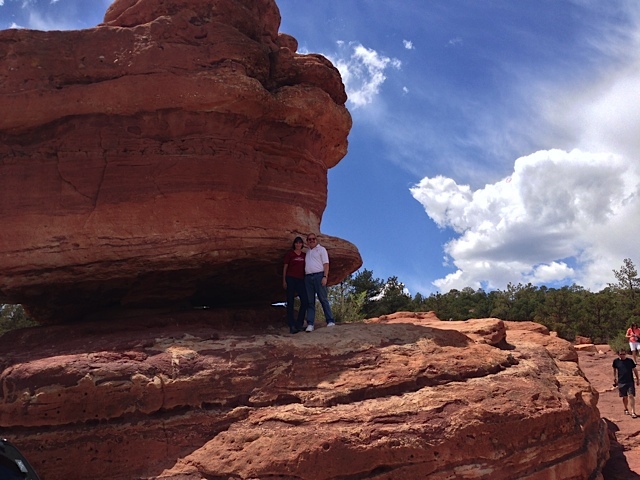 We had a great time touring the Garden of the Gods, a nearby natural park that exhibits some really unusual geology. Next, we took in the older part of Colorado Springs, where we had lunch and did a brief bit of window shopping. Then, we took a three mile hike in nearby Fox Run Regional Park; we got a bit lost near the end, but the MapMyWalk app on our iPhones bailed us out and helped us find a direct route back to the car. Finally, we returned home in time to get cleaned up for dinner out, along with Kelly and her boyfriend Jared. Dave took us to the Augustine Grill in nearby Castle Rock, a fairly high-end restaurant located in a charming old Victorian home. The food was very good, and the company was, of course, wonderful; we all had a really good time. The following day was a Friday. Dave and Brigid’s oldest son, Mark, had wrapped up his Master’s degree at Notre Dame by this point, and graduation was that weekend. Accordingly, the David Wilsons had reservations to fly out of Denver later that afternoon. As our train wasn’t until early on Saturday morning, we had made reservations to stay in Denver overnight. Everything was in perfect alignment: Kelly checked in at school (she still had a couple of days left to go) and then cut out early. We all then loaded up the car and David and Brigid dropped us off at our downtown Denver hotel on their way to the airport. Not having ever spent any time in Denver before, Nancy and I had been unfamiliar with Denver-area hotels and restaurants. When making our travel plans we had asked David for recommendations. The hotel was easy: he told us that our folks enjoy staying at the Brown Palace Hotel, so I had immediately made a reservation. After consulting one of their friends who was a local food blogger, they also came up with a recommendation for dinner: Fruition Restaurant. 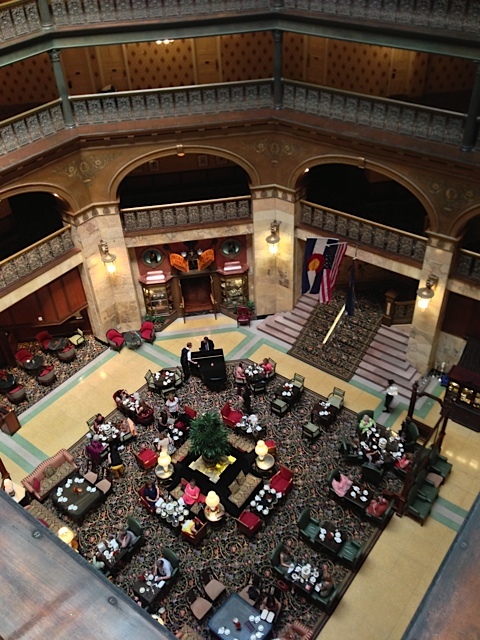 The hotel is a true Denver treasure, having stood downtown for more than 120 years. It is a true luxury hotel (and spa, although we didn’t get to experience that part) that serves high tea in the afternoon in the large central lobby. The central lobby is a giant atrium that extends all the way to the stained-glass skylights that sit atop the ninth floor. Floors two through seven have open hallways that run the full perimeter of the atrium, allowing guests to look down upon the lobby and up at the skylight from almost any floor. The painted iron scrollwork railings on the atrium side and the particular wallpaper pattern used on the room side of the hallways gave them something of a “Disneyland Haunted Mansion” feel (in a good way, of course!). Our fifth-floor room, with its king-sized bed, was nicely sized and extremely comfortable. The hotel is somewhat on the pricey side, but I felt it was worth the cost. As for Fruition? Fruition is located about two miles from the Brown Palace Hotel, in a tiny building that appears to have once been a house. Fruition has their own farm just south of Denver where they grow much of the produce used in the restaurant. The farm is also is an artisanal sheep dairy and creamery, the products of which again go to the restaurant (and elsewhere; they also sell products to other restaurants and at retail). The food is fresh, local, and excellent, but don’t just take my word for it: in 2011 Zagat rated Fruition as the number one restaurant in all of Colorado! I ordered the English Pea Bisque to start, and it was light and creamy, with a nice, but not terribly strong, pea flavor. This is not your average pea soup! For my entree, I had the Colorado Spring Lamb Loin. A proper-sized portion (i.e., not too big) of lamb on lamb and ricotta tortellini, it was perfectly cooked and excellent to taste. Nancy elected to start with the Spring Asparagus Salad, and it was amazing: the asparagus was thinly sliced the long way, as if with a mandoline, and topped with ricotta (from their farm), asparagus gelatine, radishes, and a vinaigrette dressing: fantastic! She also ordered the “Grazing Vegetarians” entree, which consisted of two courses: a small portion of ricotta/asparagus tortellini, and a plate of fingerling potatoes, carrots, and onions covered in some sort of a wonderful sauce. Finally, we couldn’t skip dessert: I had their Lemon Meringue Pie, while Nancy tried the Crème Fraîche Coffee Cake. My pie (individually sized, not a slice) was excellent. Nancy’s dessert consisted of a couple of different items, but the main part–the coffee cake–she loved since it had Sticky Toffee sauce on it (Sticky Toffee Pudding has become Nancy’s all-time favorite dessert, so anything even remotely resembling it gets a thumbs-up in her book). As you can probably tell, we loved this restaurant and would go back in a heartbeat. If you are ever in Denver, book a table at Fruition: you won’t regret it. Just do it well in advance, as the restaurant is very popular and books up quickly. We had planned to ride to Fruition in a taxi, but the hotel offered to give us a ride to the restaurant in their courtesy car. How could we say no? Afterwards, we elected to walk back to the hotel, both to see more of Denver and to work off the fine meal we just had. Fruition is on the edge of a nice upper-middle-class residential area, and most of the walk back was along quiet residential streets lined with nice-sized single-family homes. We admired the homes as we walked, and were pleased to see a few families outside enjoying the last bit of daylight. Our timing was near perfect; we neared our hotel just as it started to get dark. Once back at the hotel, we elected to sit in the capacious, but now quiet, lobby, with me working on a blog entry and Nancy continuing her genealogical research (she’s completely hooked on tracking down long-lost relatives). Eventually we went to bed, but not before reviewing the train schedule. We were again ticketed on the California Zephyr for the journey home: it continues on from Denver to eventually end up in Emeryville, California. The train was scheduled to leave Denver at 8:05am the next morning, and a quick check online before turning in for bed showed that the train was (so far) on time. We therefore had to assume that it would be on schedule the next morning, so we decided to skip breakfast (we could eat on the train) and Nancy decided not to take a shower in the morning, since she could do that on the train, too. I elected to still take a shower at the hotel, knowing that it would help wake me up. Having set the alarm for 6:00am, we went to sleep. When the alarm went off the next morning, I immediately checked on the status of the train. I was a bit pleased to see that it was delayed by about an hour: that meant that I could get some more sleep! It also meant that Nancy could take a shower in the hotel. We dozed for another hour, and then got up and showered. While I was in the shower, I received a text message from Amtrak: the train had been further delayed, and would now be getting into Denver around 9:00. Given the additional time, Nancy showered and then we elected to go downstairs and have a proper breakfast. Having done that, I checked our train status once again: now they were saying it wouldn’t get into Denver until 10:30… Knowing that the temporary Denver train station was no match for the lobby of the Brown Palace Hotel, after breakfast we once again made ourselves comfortable in the hotel lobby, periodically checking the status of our train. By 10:00, the train was due in at 11:00, so we decided it was probably time to take a taxi to the station. Although the station was only a mile from the hotel, I wasn’t sure how long it would take to get a taxi and how long, with traffic, it would actually take to get to the station. As it turns out, not long. We checked out of the hotel and immediately got into a waiting taxi, and after a short ride found ourselves at the Amtrak station. It was 10:30. As for the train? The train was still slipping further off schedule. Fortunately, there were some available seats in the station, so we grabbed two and Nancy amused herself on her iPad while I alternated between reading, playing crossword puzzles on my iPad, wandering around the station looking at posters, brochures, etc., and wandering outside to gaze hopefully at the tracks (in vain). At around 11:00 Amtrak started making announcements as if the train was imminent. A conductor situated himself at a desk and had us all come up and check in, so that we’d be able to board faster when the train arrived. They closed the baggage check-in window, and the cart loaded with baggage made its way out to the loading platform across the street from the station. And still we waited. And waited. Finally, just before 12:00, the California Zephyr arrived. Denver is a fueling and service stop, so they couldn’t just rush us on and go; we finally got out of town around 12:45. Upon boarding our car attendant announced that most of the rooms hadn’t yet been made up: all of the rooms had been occupied on arriving in Denver, and most of the sleeping car passengers had gotten off, so the one attendant for the car had quite a few rooms still to clean and make up. Fortunately, the dining car was open and serving lunch, so our attendant requested that we either go to the diner or to the lounge car until such time as our rooms were ready. Our particular bedroom didn’t look too bad, so we camped out in it until she came by to clean, at which point we moved to the lounge car. As it turns out, heading to the lounge car shortly after leaving Denver proper was a great idea. The train quickly makes its way up into the Rockies, and the view–best appreciated from the lounge car, with its large upper-level windows–is spectacular. The tracks go through a set of switchbacks, providing an ever greater view of Denver as the train climbs high into the mountains. The train travels through 29 tunnels as it makes its way up and over the Continental Divide, the most impressive of which is the Moffat Tunnel: at 6.2 miles long, it takes the train 15 minutes to traverse this tunnel which takes the train beneath the Continental Divide and onto the western slope of the Rocky Mountains. Shortly after passing through the Moffet Tunnel the train stops in Fraser, the station for the nearby Winter Park Ski Resort. I found Fraser–particularly, its climate–fascinating: they call themselves the “Icebox of the Nation” as it is the coldest incorporated town in the lower 48 states. With an annual mean temperature of 32.5 degrees F, its growing season averages from 4 to 7 days long. 4 to 7 days! Per year! Fortunately, on the day we were there it wasn’t that cold; with my jacket on I was comfortable enough on the platform during our brief stop. The train joins up with the Colorado River, following it for a good long way through beautiful canyons populated by eagles (we saw several, thanks to the conductor coming on the PA and pointing them out) and river rafters and campers who happily mooned the train (the conductor doesn’t point this out, but it is a regular occurrence on this train in this part of the country). The Zephyr is one of my favorite trains: it is scheduled such that you are awake and able to enjoy the view both as the train traverses the Rockies and as it works its way up and over the Sierras. You sleep during the boring parts of the trip: the flats of Utah and Nevada. We had left Denver about four and a half hours late, but interestingly by the time we went to bed we were only about three and a half hours behind schedule. And when we woke up the next morning, things had further improved to where we were approximately three hours late. Still late, but a great improvement. Heading through Reno, Truckee, and over Donner Pass, we continued to make up time; eventually, we pulled in to our final destination, Emeryville, only about two hours behind schedule. We had arranged for our friend Audrey to pick us up, and Nancy was careful to keep her apprised of our progress as we went along. Thus, she didn’t have to wait around in the station for us. Needless to say, we were very pleased to see her waiting for us on the platform as we disembarked. Amtrak is well aware of their on-time performance, and takes its responsibility to get people to their final destination seriously. From Emeryville, Amtrak runs a bus to San Francisco; that bus was held at the station until our train arrived. Other folks needed to make a connection in San Jose; they were taken off the train in Sacramento and put onto a commuter train that got them to San Jose in a more timely fashion. Sitting in our room, we overheard one of the latter passengers who was worried that she wouldn’t make the connection to Caltrain; it seems that her final destination was Redwood City. When we heard that, we knew we had to offer to help. Nancy talked to the woman, who, as it turns out, lives less than half a mile from our house. After checking with Audrey, we told her we’d see her safely home from Emeryville. She was extremely grateful; as it turns out we got her home well before the commuter train from Sacramento would have pulled into the San Jose station. And shortly after dropping her off, we, too, were safely home. That’s it for the step-by-step details of the trip. I have a few overall thoughts to express, however; I’ll save them for my next and final (for this trip, anyway!) post. 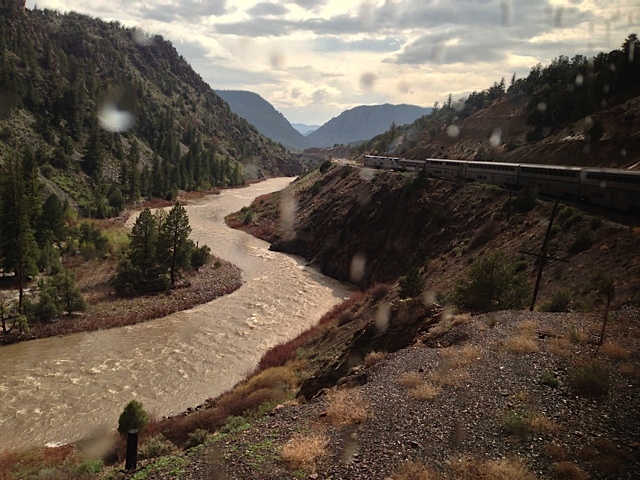 This entry was posted in An Amtrak Grand Tour on May 24, 2013 by Greg Wilson.